When you adopt Quvu, you’ll receive four different components: the Admin Console, Compliance Console, Supervisor Console and Agent Console, empowering you to easily manage permissions and keep your contact centre organised. This allows senior management to oversee the entire contact centre operation and administer changes to the teams, queues, dial data and have access to an extensive set of statistics including the ability to customise, add or remove statistics. Used by senior management level, the Admin Console is at the heart of your Quvu account. It is where you add, remove or edit users and their permissions, and configure which team they are in. It’s also where you handle your queue/campaign management. Here, you can set up your disposition buttons, which are completely customisable, and allow agents to mark the outcome of a call – for example, if there was a sale, if the customer was not interested or if the call was re-queued or rescheduled. Each disposition button activity is tracked in real-time, so the resulting click of a disposition button after a call will immediately show under the ‘Call History’ tab. In this tab you can listen to call recordings and obtain all the information from previous calls, including details of the agent, their team, the data source, talk time and customer information. You can also take total control of your Ofcom compliance by setting your dial timeout, abandonment rate – which is set at 3% by default – and message to play on abandoned calls. 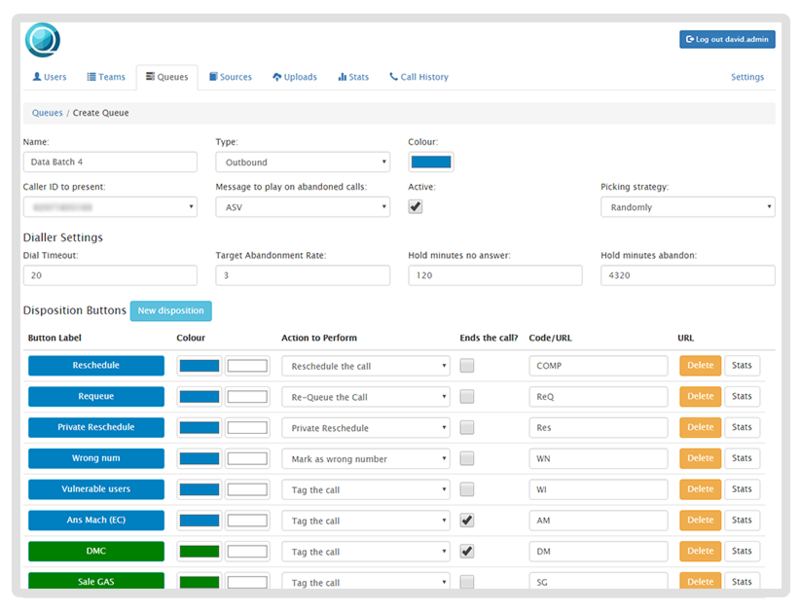 Our powerful call re-queuing tools allow you to build a re-queue strategy for each of your queues/campaigns, by specifying the hold minutes between trying any ‘no answer’ call again and hold minutes between trying any abandoned record again. The Admin Console is where you upload your dial data and analyse how your data is serving your campaigns. With Quvu there are three levels of data analysis available for you to drill down into, allowing you to easily compare between your different datasets and take action accordingly. Firstly, you can analyse by Queue/Campaign, which will give you an overview of all your campaigns and how many data sources they’re using. Analyse by ‘Sources’, where you can manage your data providers and compare them against one and other – for example, ‘Data provider A’ and ‘Data provider B’. You can then drill down even further in the ‘Uploads’ tab, by analysing how the individual data files from your data sources are performing. This is an exceptionally powerful tool as it presents you with the ability to pause any poor performing datasets, focusing your resources on better performing ones. For example, let’s say both ‘Data provider A’ and ‘Data provider B’ had three data file ‘Uploads’ each. On analysing how they were performing you noticed the three data file uploads for ‘Data provider B’ had amassed 50, 31 and 24 sales respectively, while the three uploads for ‘Data provider A’ had only acquired 10, 5 and 6 sales respectively. In this scenario you would consider pausing the ‘Data provider A’ files and focus your agents on ‘Data provider B’. The ‘Stats’ tab can be anything you want it to be and is only limited by your imagination, as it is completely customisable through a simple yet effective stats configuration function. Choose the stats you want to see using the ‘Columns’ filter to gain a detailed insight into your contact centre performance, where you can choose to break the stats down by queue/campaign, data source, an entire team, an individual agent or date. Create as many statistical views as you wish, allowing you to set up various groupings and flick between them within the click of a button. For example, you could set it up so that in one view you can analyse statistics from your datasets, whilst in another you could analyse your team and individual agent statistics. Here, quality control staff ensure your contact centre is not breaking any industry regulations, whilst also complying with your company’s codes and ethics. Ensuring complete contact centre compliance, in line with industry regulations, is a huge concern for contact centre managers today with a serious risk of incurring large fines if regulations are breached. 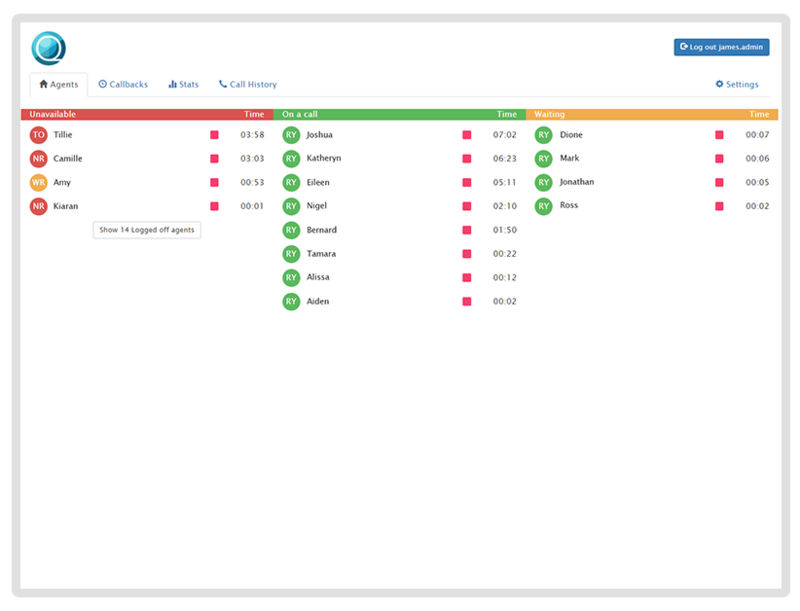 That is why we have built a stripped-down version of the Admin Console to give your staff who deal with quality and compliance a simple, user-friendly platform to ensure your organisation and staff are staying within the boundaries of Ofcom regulations. 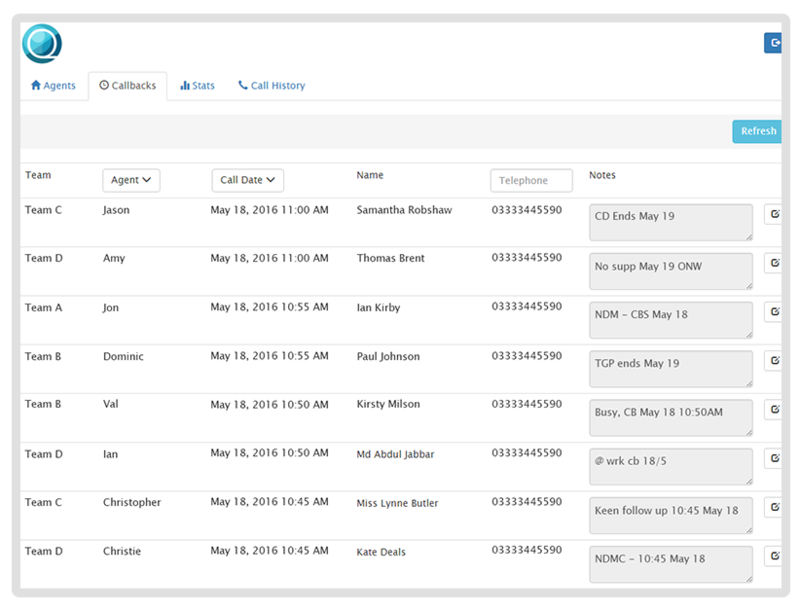 From within your Compliance Console you can easily locate specific call recordings, through a number of functions that help you narrow your results right down to the specific agent if necessary. Search by telephone number, agent, campaign, date range or even disposition. This allows you to swiftly pinpoint the recordings you need. For example, if you needed to check that all sales within a certain date range were compliant with regulations, you can use the disposition to narrow your recording results down to sales, select your date range and then download/listen to the relevant recordings. When you have scripts that agents must strictly adhere to, it is a very effective way of making sure they are doing this and identifying agents who aren’t so they can be retrained by the Supervisors. 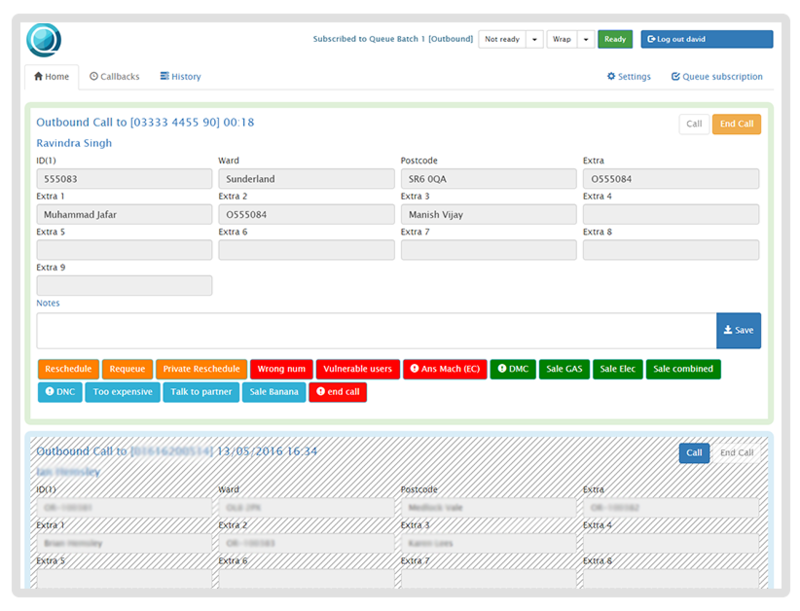 Used by middle management level, such as team leaders, the Supervisor Console provides a wealth of information and data; from individual agents to teams and campaigns. The clean and user-friendly interface makes monitoring the behaviour of agents painless, with the ‘Agents’ tab clearly showing the current state of your selected agents – unavailable, on a call or waiting for a call. Next to the agent name you will be able to use enhanced agent state tracking to get a bigger picture of your agents’ current states, helping you identify trends or anomalies such as if an agent appears to regularly spend more time than is acceptable on breaks compared to their peers. This state tracking is completely customisable; typically they will reflect if an agent is on a rest break, in training, being call coached or completing after call work. Supervisors actually have the ability to control agent states should they wish. This is useful if you think an agent may deliberately be staying in ‘Not Ready’ mode to avoid a call. In this scenario, simply click their state and put them into Ready and the dialler will do the rest. Just like in the Admin Console, the ‘Stats’ tab enables you to gain a comprehensive statistical understanding of your overall contact centre performance, allowing you to analyse stats by queue/campaign, data source, team, individual agent or date. With the level of detail you can drill down to, you’ll easily be able to catch issues before they become a serious problem, identify if you’re hitting targets or reward good performance. Staying on top of how agents are handling calls is crucial to understanding why they are producing the results you see in the statistics. This is where the ‘Callbacks’ and ‘Call History’ tabs are invaluable, as they provide an insight into how agents are interacting with customers and help you identify areas for improvement. Explore how callbacks are being marked; if you notice a particular agent is racking up a string of failed sales it could indicate they are struggling to push sales over the line, in which case pouring over their call history and listening into their recordings could help you identify flaws in their sales technique. Call recordings are searchable and also linked to disposition buttons, providing you with another technique to help agents improve their call handling skills. You can listen into agent calls as they are happening live with Quvu’s silent monitoring facility, giving you the opportunity to in-call coach. The agent will be able to hear your advice, but the customer will not, so if you identify an agent struggling to push a sale over the finish line you can step in and offer guidance. 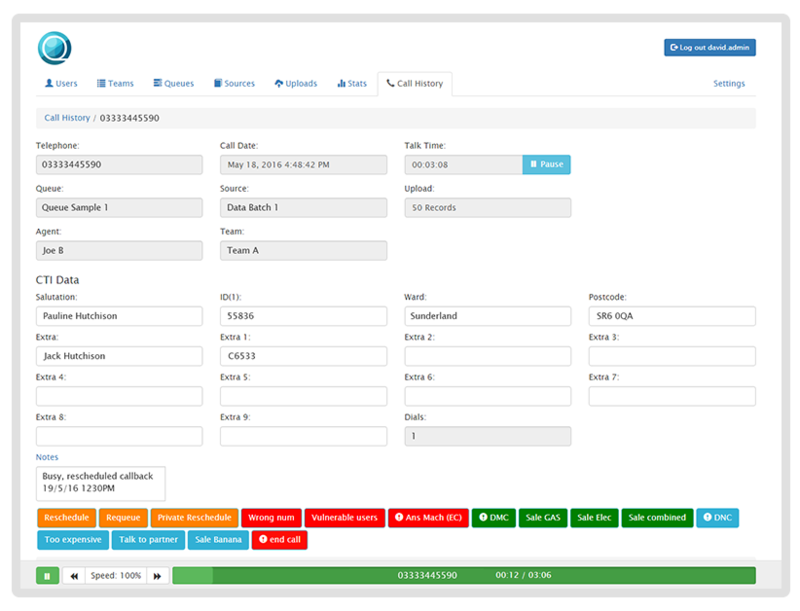 This console provides agents with a simplified, complication free platform to manage their calls. The agent console delivers a simplified approach to a complicated problem, with an easy to use interface that allows the agent to maximise performance. This minimises the possibility of distractions and leaves your Administrators and Supervisors firmly in control. Agents can simply log in, click Ready and the dialler will start passing calls through to them. This is because the campaigns that agents are subscribed to can already have been taken care of by the Supervisors, who can handle which campaigns they join on the agents’ behalf – this makes it nice and easy for the agents to be able to log in to their console and quickly get on with their calls. Quvu’s manual callback function is an extremely helpful tool for agents. Should an agent be making progress on a call and accidentally cut the customer off, this one-click button allows them to immediately call the customer back and pick up where they left off. With the intelligent way the Agent Console works, agents can handle calls professionally. They can end a call with a straight forward one-click end call button, however, Quvu intentionally gives you the ability to prevent agents being able to end successful sales calls with one click. This is to prevent data being skewed should an agent get a bit carried away towards the end of a call, by presuming they have a sale wrapped up, then clicking a ‘sale’ disposition button and accidentally cutting the customer off before formally completing the sale. The easy to use disposition buttons could not be simpler in order for agents to requeue records by sending them to the back of a queue or manually reschedule a callback on a specific date and time. If an agent wishes to schedule a callback that is ‘owned’ to them, they can simply use the ‘Private Reschedule’ disposition button and it be placed into their ‘Callbacks’ tab. 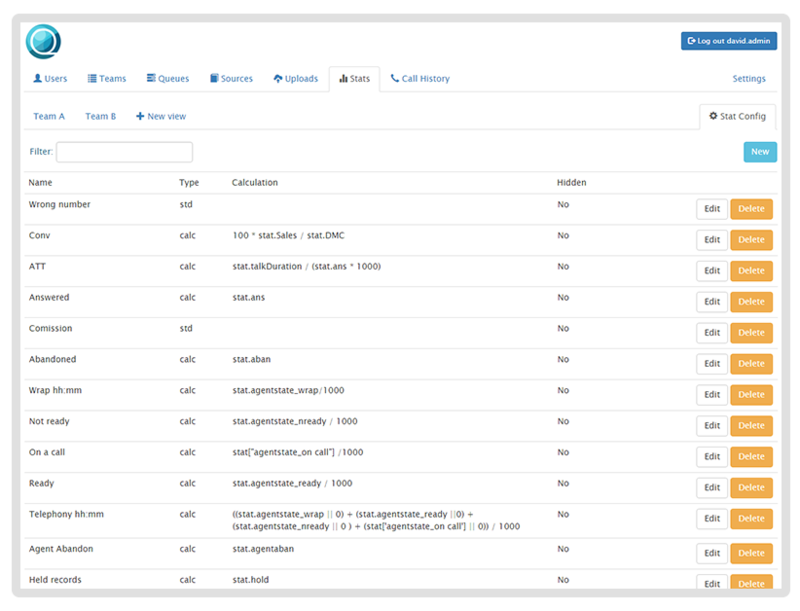 Quvu’s tabular layout facilitates agents to easily access other functions of the Agent Console, such as the manual callback system. The manual callback system enables agents to keep their own diary for when they have callbacks coming up, clearly stating their date and time. They will also receive notifications to minimise the chance of a callback being missed. 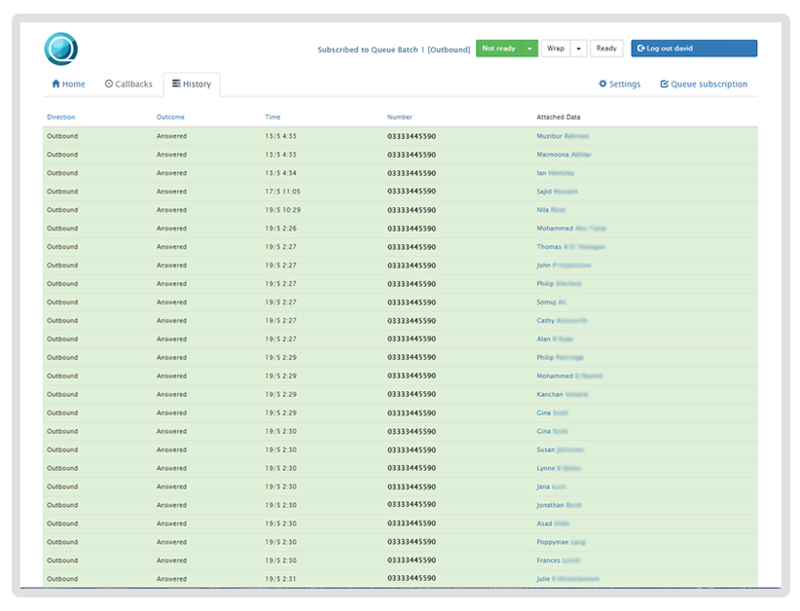 The ‘History’ tab also acts somewhat of a diary, storing the agents’ last 50 calls. 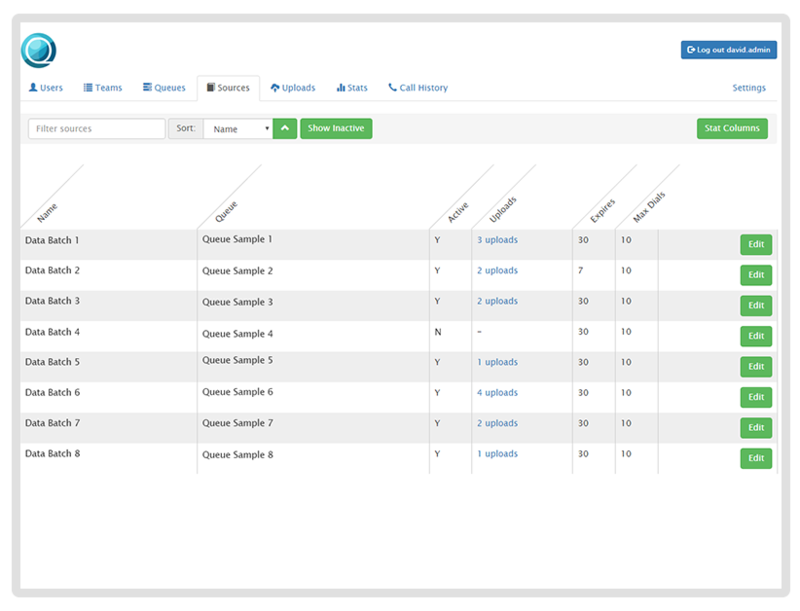 This functionality makes it easy for agents to check previous calls and update any attached data if necessary. Say an agent mistakenly marks the wrong disposition after a call; this gives them the ability to go back and update that disposition correctly without ruining any data or having to inform their Supervisor, making the whole process slicker.